The Eddleston Water is a 20km tributary of the River Tweed near Peebles. Over time, the course of the river and catchment has been extensively altered and virtually the whole of the main stem was straightened in the early 19th century. These changes have damaged the river environment, leading to the loss of over a quarter of the river’s original length, and habitat loss for plants and animals, including salmon and trout. It has also resulted in an increased risk of flooding to Eddleston and Peebles, as rainfall and flood waters travel ever more quickly and directly from the hill slopes and along the river channels towards these communities. 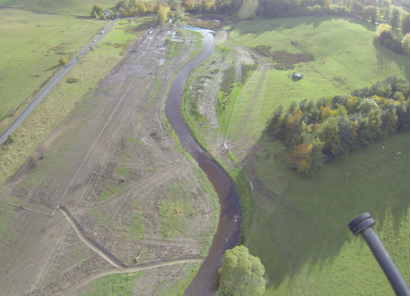 Over 65 ha of riparian habitat improvement including the planting of over 70,000 trees. Construction of fish friendly log jams to hold back flow in the headwater burns.The following photos show some of the recent work to restore meanders. More information can be found at http://www.tweedforum.org/projects/current-projects/eddlestonThe project is a partnership initiative led by the Tweed Forum with support from the Scottish Government, Scottish Environment Protection Agency (SEPA) and the University of Dundee.